1. Preheat oven to 350F. Combine mashed bananas and lemon juice in a small bowl and set aside. 2. Beat butter and sugar at medium speed until creamy. Add eggs, one at a time, beating until blended after each addition. 3. Combine flour, baking soda/powder and salt. Add to butter mixture alternately with buttermilk, beginning and ending with flour mixture. Beat at low speed just until blended after each addition. Stir in vanilla and banana mixture. 4. Place paper liners in 2 (when I made them I ended up with 36 cakes, so if you have 3 pans you might want to prepare for that many if you have three pans) 12 cup muffin pans, and coat with cooking spray ( i didn’t do this….sorta forgot 😉 ); spoon (or scoop) batter into cups, filling 2/3 full. 5. Bake at 350F for 12-15 minutes or until a wooden pick inserted in the center comes out clean. Cool in pans on wire racks for 10 minutes; remove from pans and let cool completely. 2. Combine mashed bananas and the remaining ingredients in a medium saucepan over medium-low heat. Cook, whisking constantly, until mixture thickens and coats a spoon. (Do not boil.) Cool completely. Note: Store any leftovers in an airtight container in the refrigerator for up to three days. 1. Beat whipping cream at high speed until soft peaks form. Add vanilla and powdered sugar and beat until stiff peaks form. 2. Store in refrigerator until ready to use. 1. Prepare the Banana Cake as directed. 2. 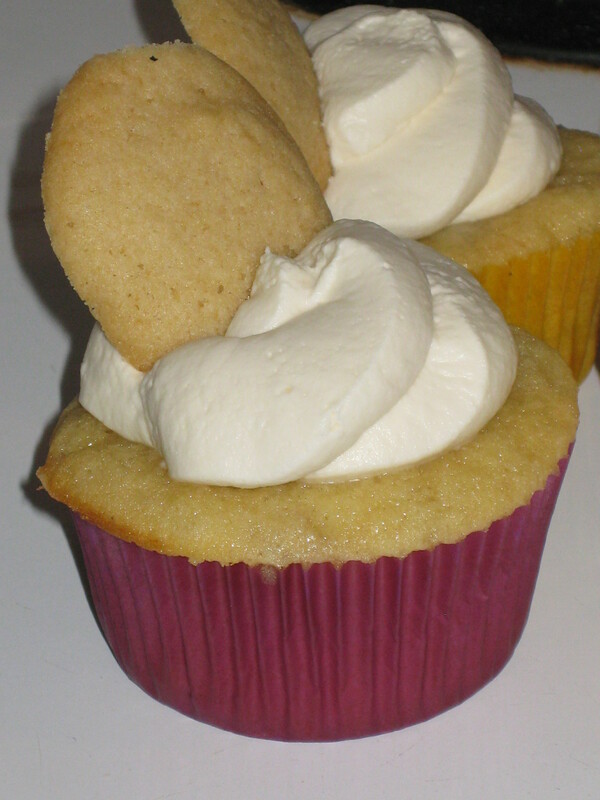 Insert the end of a wooden spoon or dowel into the center of each cooled cupcake to create a hole. Fill a zip-top freezer bag with Fresh Banana Curd. Use scissors and snip off about a 1/4 of an inch off one corner of the bag. Insert bag into hole in cupcake. Squeeze gently until curd comes out of the top of the cupcake. Repeat with remaining cupcakes. 3. Frost each cupcake with approx. 2 tbsp of the Fresh Whipped Cream, using a piping bag (or another zip-top with the corner cut off) and a round piping tip (or none at all) pipe a swirl of cream onto each cupcake. Top each with a vanilla wafer and slice of banana (if desired) just before serving. Recipes adapted from Simply Sweet magazine. Enjoy! !